Supplies: one yard of fabric with stretch and drape. Great for a last minute gift, this shrug can be worn several different ways and takes a few minutes to make. 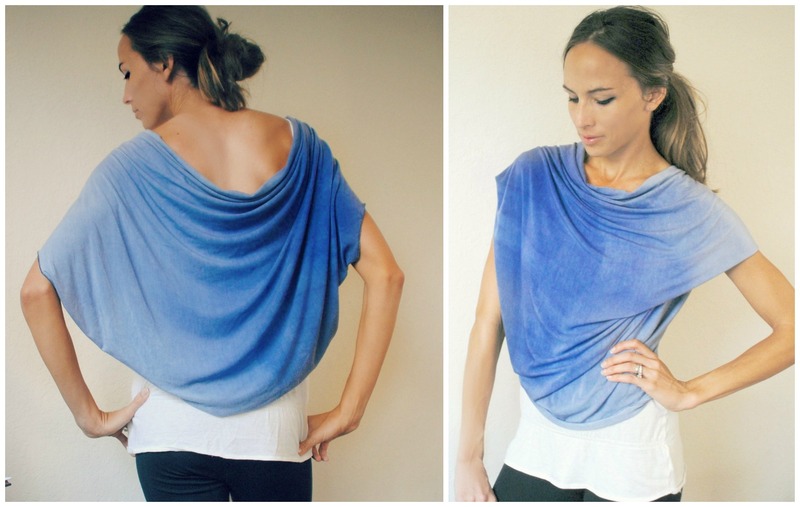 Get some fabric and make it for the whole family. Cut a rectangle of fabric measuring 36 inches wide and 30 inches long. I hand dyed mine, before it was white jersey. I serged the edges as well. 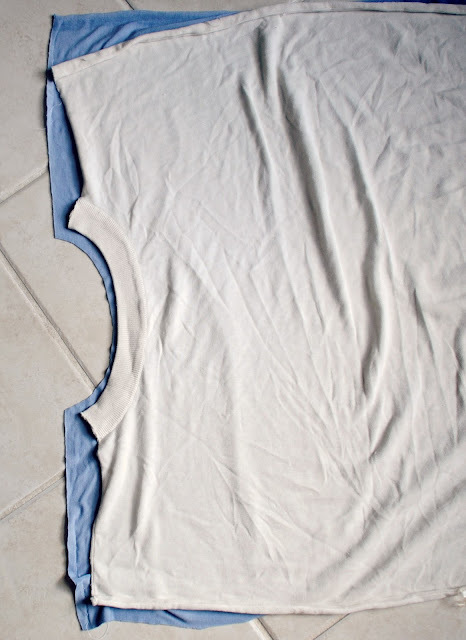 If you use a jersey you can easily leave the edges unfinished. Just tug to get a roll. Cut the sleeve hole using a collar in the middle on both sides. Fold length wise in half right sides together. Sew the part where the arrows are placed. Add a closure in the middle. This literally can take 5 minutes minus hand dying the fabric. Finishing the edges will add more. Qué idea más bonita, me encanta el resultado. Es precioso. Great DIY! Happy Holidays! Enjoy. People should say this more but thank you for sharing your genius mind with us. This is going on my diy project list, simply amazing. 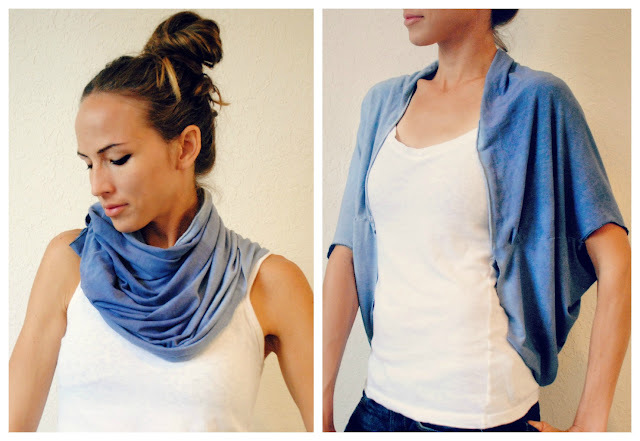 A really nice idea, but could you explain how you wear it in pictures 1 and 2? Is it just buttoned on the other side, or is it some other kind of wearing? Thank you! Many thanks, I just finished it in 15mn! I love this kind of project, so fast, easy, and cherry on top, gives you different looks! The leftover will make a nice headband! Hi, this is so cute! You are so creative I love it :) I am new to sewing, can you please tell me where you sew the seam? I don't understand if its across the top from left to right or along where the arrows are laying?? Sorry may seem totally obvious to most but my eyes are new to this!! Thank you !! ^ agreed with Ashley, don't know where the arrows say to sew! sew where the arrows are placed. Um, "sew where the arrows are placed" could be a lot clearer. How much do you sew? Where is the starting point, where is the end point? How much seam allowance? I love this idea, and I've sewn for many moons, but, I'm sorry, I can't tell what you mean. Thanks so much! 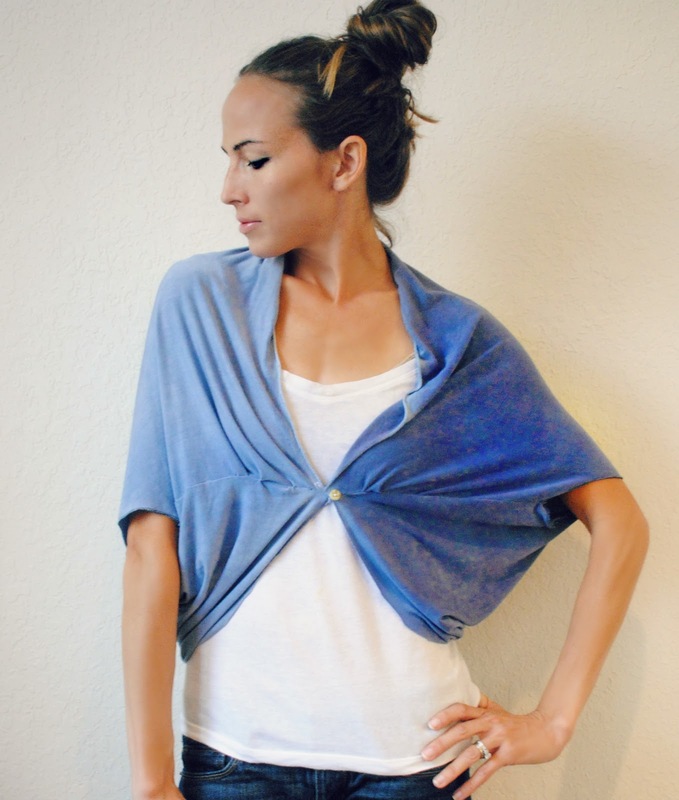 Hi can you tell me how I would make this shrug longer and more drapey in the back? Would I need to add to both dimensions? your ideas are amazing !!!!!!! How did you wrap it like a scarf? Anda punya kesempatan mendapatkan lucky spin gratis untuk mendapatkan uang TUNAI setiap harinya. Persyaratan aktif wajib memiliki minimal Turnover di Dewatogel. DEWATOGEL memberikan bonus untuk para member DEWATOGEL setiap harinya. Hanya dengan aktif bermain dan melihat Togel singapura 2018 hari ini keluar adalah promosi cuma-cuma dari Dewatogel.com Tidak di PUNGGUT BIAYA!! GRATIS!! Persyaratannya hanya cukup AKTIF bermain di Dewatogel.com saja.ain di DEWATOGEL Asia anda sudah berhak mendapatkan bonus free spin berhadiah Uang Tunai! !